Apple has issued an unprecedented apology over its handling of the admission it slows down older iPhones. The firm said last week it 'throttles' phones to extend their life and stop them from shutting down as batteries age and become less effective, triggering lawsuits across the world. Today it published a letter saying 'We know that some of you feel Apple has let you down', and revealed it is slashing the price of a replacement battery, and planning to show users exactly how much their battery has degraded. Apple said it is reducing the price of an out-of-warranty iPhone battery replacement by $50 — from $79 to $29 — for anyone with an iPhone 6 or later whose battery needs to be replaced, starting in late January and available worldwide through December 2018. The firm will also cut prices around the world, but has not yet revealed the pricing outside the US. In the UK, a replacement battery costs £79. Early in 2018, it will issue an iOS software update with new features that give users more visibility into the health of their iPhone’s battery, so they can see for themselves if its condition is affecting performance. The firm said last week it slows down phones to extend their life and stop them from shutting down as batteries age and become less effective, triggering lawsuits across the world. HOP said it filed its complaint against Apple in Paris on Wednesday. A prosecutor opened an investigation into Epson last month, a judicial source said on Thursday, following a complaint filed in September by HOP in a court in the Paris suburb of Nanterre. One of the lawsuits, filed Thursday in San Francisco, said that 'the batteries' inability to handle the demand created by processor speeds' without the software patch was a defect. In a statement sent to MailOnline, a spokesman for Apple said: 'Our goal is to deliver the best experience for customers, which includes overall performance and prolonging the life of their devices. A consumer watchdog that evaluates electronic gadgets' performance sparked the outcry after it found that processing power of older models is limited once battery life begins to suffer. Apple has come under fire for not being clear with users about the software update, or explaining when throttling happens. The update reduces this drain on resources, allowing the phones to continue operating. The drop in performance came to light in benchmark tests, from Toronto-based firm Geekbench. 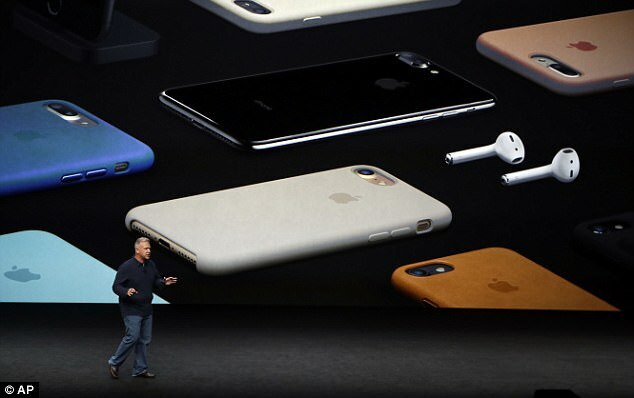 It found that on certain versions the Apple operating system, phones with older batteries achieved much lower performance scores. Battery capacity is expected to decrease as they age, but processor performance should stay the same. However, users with older iPhones with lower-than-expected Geekbench scores have reported that replacing the battery increases their score, as well as the performance of the phone. 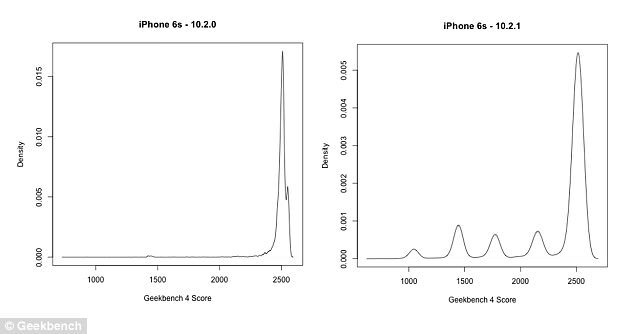 Geekbench developer John Poole decided to analyse the results of a number of iPhone 6 and 7 models running various versions of iOS. He found that an update issued to fix the 'sudden shutdown' issue, when users found their iPhone 6 was turning off when its battery reached half charge, was to blame. This resulted in the poor performance results observed. Writing in a blog post, Mr Poole said: 'It appears the problem is widespread, and will only get worse as phones, and their batteries, continue to age. 'I believe, as do others, that Apple introduced a change to limit performance when battery condition decreases past a certain point. 'If the performance drop is due to the 'sudden shutdown' fix, users will experience reduced performance without notification. 'Users expect either full performance, or reduced performance with a notification that their phone is in low-power mode. Without this warning Mr Poole believes that the fix will cause users to believe their phone is slow so they should replace it, rather than the battery which is actually at fault. 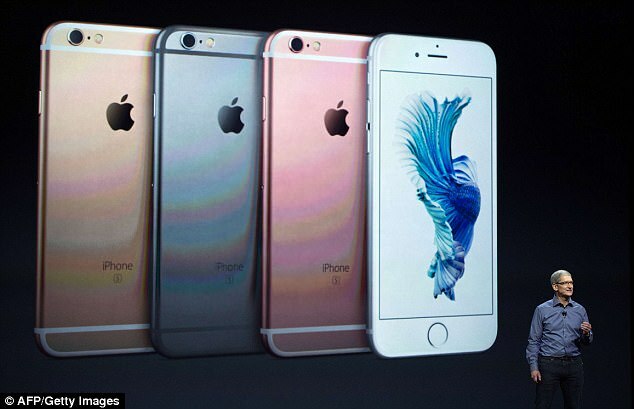 'This will likely feed into the 'planned obsolescence' narrative,' he added. Every time Apple launches a new handset people seemingly flock to Google to ask why their current iPhone or iOS is slow. This trend has been seen every year since Apple released the iPhone 3G in 2008. This is the idea that manufacturer's deliberately make their products in such a way that they become out-of-date sooner. Bull biscuits!! Typical Zionist jew lie. They want everyone who has older iPhones to sucker in for a new one.